Looks like a Lion King character. Let's tip some beers Steven......been a **** long time. Mercedes with Mark - I'll roll? I think we should gaggle....seriously. Shooting dove this weekend. Sunflowers are close to Mark's house. Come on down! If you need directions, hit me up. He agreed that the horns need adjusting. If I had to guess, this taxidermist doesn't see a lot of antelope. Last edited by SCREAMINREELS; 08-30-2018 at 09:46 PM. I think I'd being back in the taxidermist shop with those pictures side by side asking some questions. The mount doesn't look as bad as his pic as it sat in my office for a month or more. There is something wonky with the camera angle (wide angle lens) as the nose is not that wide. Here is another pic of it (it's on the left). With that said, the horns are just not right. The rest of the mount doesn't look as bad as it does in his pic. I'm glad they're stepping up. Respectable shop that I hope will make it right. Yeah that’s a better pic. Get the horns adjusted and it will be good. 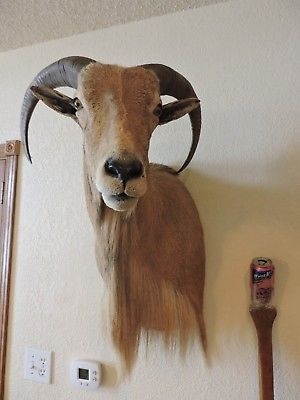 First let me say I don't do taxidermy for a living but I do love to hunt goats and do my own mounts and I hope i can explain the differences between lets say mounting a WT and antelope. First is the manikins. Most deer species are pretty uniform in their skull dimensions so little if any modifications need to be made. goats on the other hand are not so uniform and who ever does the work may need to alter the form to get the distance between the eyes correct. (that is why you have the narrow face) Now we come to the horns which aren't horns at all but hair. There are 3 components here that a taxidermist has to deal with. Once you remove the outer sheath there will be i'll call it the inner core which is where the growth for next years horn will come from. That has to be removed and under that will be the actual bone that supports everything. Once that inner core has been removed if you were to put the outer sheath back on it will flop around like you where wearing shoes that were way to big for your feet and that makes it next to impossible to know how things should look without a picture. This is just my opinion but Antelope are more difficult to do than deer at least for me. they don't fall into standard dimensions like deer do and their hair is hollow that curls in all sorts of different directions. 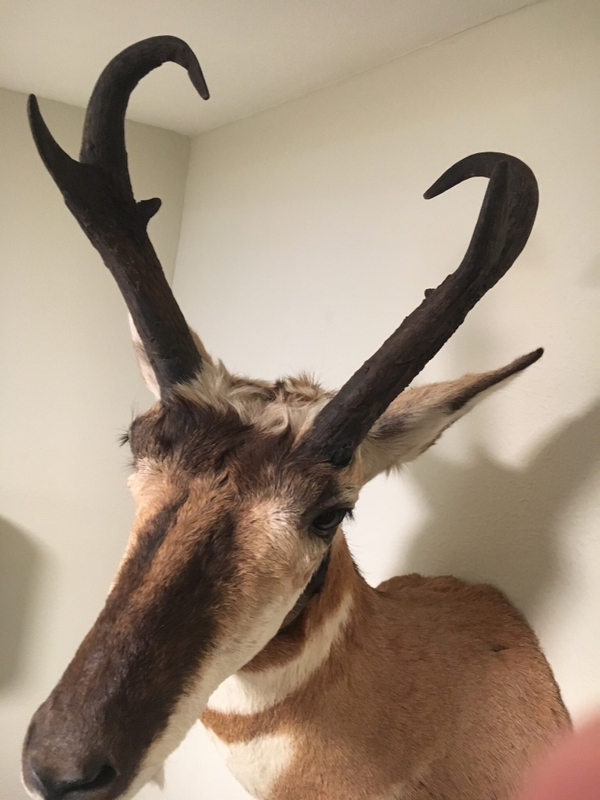 So take lots of picture from different angles, give them to whoever is doing the work and don't assume that because they do great deer mounts that they can do great antelope mounts . Look for some one who does a lot of them no matter what you are having done and is good at it. Antelope are beautiful animals and make what I think a very impressive mount. I hope this helps. Is taxi work worth it anymore? No. Euro is all I’ll ever do. The mount definitely looks better in that better photo. Horns are still off, but hopefully that'll be an easy fix. How is he going to remove the black paint without damaging the cape? I only shoot small, cull animals, so I never have that problem. OK, now I know you might be a little mad about the dikfer, but don't be posting stuff like that ... I did not mount that, and that's not even funny. The ugly lion that you posted for Jeremy, was kinda funny. I WAS actually going to start on your deer this weekend. The whole thing looks different, cape, horns and all. Maybe there was a tag mix up at the shop? The nose section looks more like a caribou. And it looks like someone may have cut the skull plate instead of mounting it intact. Left side is twisted back. Both horns are in a more narrow and less open stance. I don't see anything that is the same, except the species. Would be asking a LOT of ?s !! I will have mine mounted in Wyoming then. That is not anywhere near right. Antelope horns can only go back on the cores one way. That is not your antelope. As far as the horns go, those are the correct horns. No doubt. When putting the horns back onto the skull cap on antelope there is some wiggle room. He either wiggled too much or possibly used a skull cap off another pronghorn. It's also possible that the skull cap was broken and not put back together correctly. As far as the cape, I thought I saw some of the same scars on the face, but didn't really look that close. Why do the horns look darker & almost polished vs the original?? I dig the crusty look of the ldp horns. The dark color usually the result of boiling the crap out of them to get them to slip off the skull cap. There are much better ways to get them off than boiling. Im glad the taxi is gonna rework it for ya and I hope it comes out more like the picture. If that is the case, you might share who the taxi is after they correct it for ya. Everyone makes mistakes and it is nice to hear that they are gonna make it right for ya. I appreciate doing business with such people. I will stand tall for you little buddy and say the deer you have done for me have been awesome. He had to adjust the horns to make room for the transmitter's antenae, the mic is in his nostril. Andy's just mad right now because I left an extra gift on his aoudad's rock ... and STGS pointed it out to him. If he doesn't post pictures, I will. This and a 55 gal barrel of whoop azz ready to be opened. Horns are the same....but skull and cape are not. Horns have to be removed and tissue cleaned off, he gave you a skull and cape from another animal. The skull of this one is not as wide as yours. Good news is, the taxidermist quickly agreed to make it right. Sounds like a good dude on the phone. I'd rather not share the taxi info. The brown spot on the bridge of the face looks completely different. I hope he can make it right.